There is enough information about the creation of usable and semantically correct web forms. But most of developers don’t pay much attention to that. It may be connected with absence of a certain plan of how to build an excellent web form or another element of the web site. Here are some basic rules that must be obeyed while creating a web form. Your web form will work without labels very well, but it is very useful to use them and every professional web developer knows it. Labels tell what the input box is for and in tag you can give it a personal style. 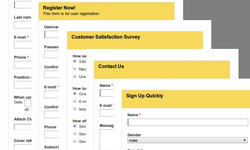 We have discussed the layout of web forms but their main purpose is to functionalise correctly. When you have written the code of the web form, you now need to know PHP or you will have to send web form to developer to write a back end code and tie the form to a database. But Web Form Factory can do it all for you and generate the code that you need. It is great if you are a professional web developer and you have enough programming skills to build a valid and fully functional web form just in a few minutes. But if you are not, don’t regret, nowadays there are lots of programs that will do all the coding job for you. 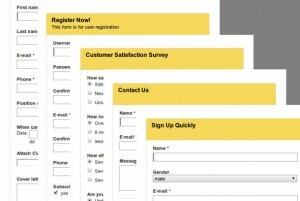 One of the best web form generators is PHPForms. It is a professional and easy-to-use program that will help you to create your personalized form in a few clicks. All you need to do – is drag and drop form elements to blank form or template and customize them according to your requirements. You can make the following forms: online surveys, questionnaires, contact, application, registration and file upload forms and much more.